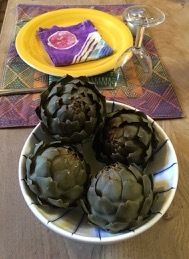 Globe artichokes have always been one of my favorite treats. I like the taste, of course, but I really love the leisurely ritual of eating them, nibbling the flesh off the base of each leaf, with lots of gaps for conversation in between (if you are not too greedy!). In our part of the world they are ready to pick through June and July, when they have swollen to their full size, but before they get too thistle-ish. The internet has lots of fancy artichoke recipes, and even tutorials on eating them, but I like the simple way: cover them in water and boil them. You can tell when they are ready by poking a fork into the stem. Then see if one of the lower leaves pulls of easily. Cooking might take 15 minutes for younger ones, or longer when they are older. Drain them well and serve with something to dip the leaves in. I like mayonnaise or melted butter best, but some people prefer hollandaise or olive oil and vinegar, etc. Keep pulling and nibbling leaves until you get near the centre. Then clear the last bits, including the fluffy stuff (the choke) away from the heart, which is the fleshy disk attached to the stem. A couple more bites, and it is all gone! Artichokes do interesting things to the taste of other foods eaten with them. I always liked to experiment with this as a child. I still do, sometimes.